Invasive parasites are a biological oxymoron. And yet, they are in our backyards! 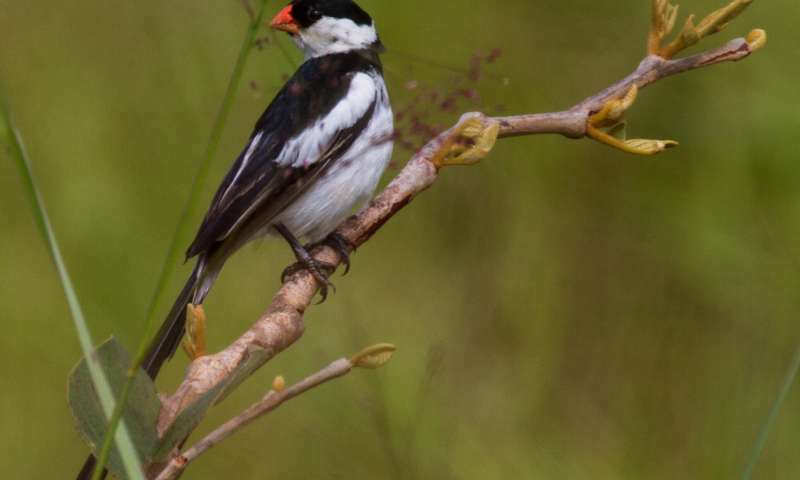 A new study analyzes the case of a brood parasitic bird, the Pin-tailed Whydah (Vidua macroura), and its recent spread into the Americas. Biodiversity hotspots—or places with large numbers of species found nowhere else on earth—also tend to make suitable habitats for invasive species that can, in turn, destabilize ecosystems and supplant indigenous biota. A new study in The Condor: Ornithological Applications predicts where the Pin-tailed Whydah, a songbird native to sub-Saharan Africa that has expanded its natural range thanks to the pet trade, may next spread in North America and Hawaii. The Pin-tailed Whydah is a brood parasitic bird that lays its eggs in other bird species, typically small African finches, and has been introduced from Africa to Puerto Rico and southern California. In this study, researchers used species distribution models to predict where the whydah may continue to spread in the continental U.S., Hawaii, and the Antilles. To determine the whydah's potential distribution, they used sightings of this species reported to the Global Biodiversity Information Facility (GBIF). The investigators then identified suitable whydah habitat by finding correlations between locations where these finches have been seen and global climate data. As brood parasites, whydahs need hosts to complete their life cycle, so the researchers also used the presence of six known host species that have been co-introduced in the whydah's new range to predict suitable habitat. Their species distribution model indicated high habitat suitability in areas of high biodiversity where whydahs do not currently live, including the West Coast of the U.S., Hawaii, and most islands of the Antilles. Robert Crystal-Ornelas, lead author and PhD student in Ecology and Evolution at Rutgers University-New Brunswick, said, "We identified key areas in the continental U.S., Hawaii, and the Antilles, that have not yet experienced pin-tailed whydah invasion, but which contain suitable climate and host species for this parasitic bird to potentially spread." Dr. Mark Hauber, the senior author of the study and Professor in Animal Behavior and Conservation at Hunter College and the Graduate Center of the City University of New York (CUNY), added, "Our work has now shown how parasitic birds, including Common Cuckoos from Eurasia and Pin-tailed Whydahs from Africa, are likely to invade increasingly novel and expansive regions in the Western Hemisphere." The Pin-tailed Whydah is a host generalist—it can parasitize novel species that share no co-evolutionary history with it and that, therefore, have developed no defenses to mitigate the reproductive costs of parasitism. To create their model, the researchers took into consideration five known historical hosts and one known novel host—all exotic species to North America and Hawaii. The presence of these hosts in a suitable habitat could enable introduced whydahs to establish a bridgehead population, providing an opportunity for the birds to utilize indigenous hosts and to increase their population and range. "This study shows how humans are not just transplanting individual species but entire ecological networks, where here an invasive bird species will likely be able to expand in the Americas due to a previous introduction of its host species," said Dr. James Russell, a conservation biologist at the University of Auckland, who was not affiliated with the study. "Worryingly, the study predicts the introduced species will most strongly invade already vulnerable island ecosystems, where it could potentially begin parasitizing native bird species, which would be a very novel form of invasive species impact." The map that Rob Crystal-Ornelas and his colleagues have created will help scientist to prioritize monitoring and research efforts, which will fully gauge the risk of additional whydah populations in North America.